Home Tech Would you implant a chip in the brain? Would you implant a chip in the brain? Neurograms are chips the size of a grain of salt that are implanted in the brain; could be key for prostrate people regaining control of their body Credit: Berkeley Univ. Last April, Vincent Leung returned home after a long day of work. This electronic engineer and director of the Qualcomm Institute Circuits Labs of the University of California at San Diego (USA) just wanted to rest and eat with his family. He changed, prepared a light dinner, sat on the couch, turned on the television and watched an episode of the dystopian series on Netflix. she had her daughter implanted with a chip in her head to monitor everything the girl observed. Then, while Leung finally relaxed, a scream altered the tranquility of his home. "It's what you do!" Yelled his wife, who was right next to him. Vincent Leung does not deny it. "That's fiction," she clarifies, "but it's true, we're doing more crazy things than what you see in the series." Leung is one of several researchers who cross the borders of what is scientifically possible by developing increasingly powerful neurotechnologies. neurograins -or neurograins- and they are chips the size of a grain of salt. "Look -extend a small black box in which you can see tiny metallic dots- Are not they cute?" Leung moves comfortably in his laboratory full of cables, integrated circuits, amplifiers, screwdrivers and blackboards. For decades, he devoted himself to improving the power of mobile phone chips. Now, he says, it's time to design chips for the brain. It seems to be the next logical step. the technologies will penetrate the skin and enter into our bodies. "It's a great scientific challenge," says Leung, "at first, the idea is to implant neurograins in the cerebral cortex, that is, the outer layer of the brain, of people who have lost some function due to injury or illness. through tiny electrical pulses, stimulate atrophied neurons. " 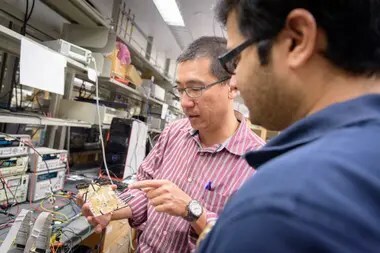 Leung's team at the University of California at San Diego is part of a broad international collaboration – which also includes Brown University, Massachusetts General Hospital, Stanford and Berkeley universities, and the Wyss Center for Bioengineering in Geneva. – to develop wireless neuronal prostheses capable of recording and stimulating brain activity. Tens of thousands of neurograins could function as a kind of cortical intranet, wirelessly coordinated through a central communications center in the form of a thin electronic patch placed on the skin. This would open new neurorehabilitation therapies, especially taking into account that this network has both 'reading' and 'writing' capabilities. Neurograins could 'read' neurons, that is, record their electrical activity, and they could also stimulate them. "We could transmit data from the outside world to neurograins," says Leung, "for example, projecting sounds to deaf people or images to the blind: if a blind person has their visual cortex intact we could take a picture with a camera and wirelessly send a encoded signal in a language that the brain can understand. " BrainGate: a tiny silicon chip of four millimeters on the side with one hundred electrodes. It was the first brain-computer interface: a system through which signals are processed and sent that traveled through a bundle of wires that came out of Nagle's scalp to an electronic cart with the size of a refrigerator that allowed it, between other things, changing the channels of a television, adjusting the volume, opening and closing an orthopedic hand, moving the cursor of a computer, reading emails and playing with video games just by imagining that he moved his arm. "Bionic brains come true," the Nature magazine then called it. Since then, these neurotechnologies have only diversified. In addition to the thirteen paralyzed people using the BrainGate system, two monkeys with brain implants at Duke University were able to steer wheelchairs using only their minds. "These technologies will open up a world of possibilities," says entrepreneur Steve Hoffman of the Founders Space start-up, "not only will it allow us to communicate mind to mind, but also connect us to the internet through the brain." Down and Out in the Magic Kingdom – a near future in which everyone is connected to the network 24 hours a day through a cortical link – until one learns of DARPA initiatives as a program with a budget of four million dollars called Silent Talk, whose The objective is to "allow user-to-user communication on the battlefield without the use of voice through the analysis of neural signals". A paraplegic man used a robotic exoskeleton controlled by the mind to kick a ball. In this time, miniaturization has accelerated. In 2011, a team from the University of California at Berkeley first described tiny silicon particles they called "neural dust", broadly based on the same principles of neurograins. In 2017, two of its inventors, the neuroscientist José Carmena and the engineer Michel Maharbiz, opened the Iota Biosciences company to develop these wireless implants that could change the way we understand our bodies: they are able to monitor in real time muscles, organs and nerves in the depths of the body – as they demonstrated in the magazine Neuron. They can treat epilepsy and bladder control and, also in the future, control prostheses. The sensors of this neuronal powder are communicated through ultrasound with a patch that activates them and receives information for any desired therapy. Its impellers imagine that they could be implanted in a simple ambulatory procedure, according to Carmena, in the same way that a person gets a piercing or a tattoo. revealed details of a new company, Neuralink, in San Francisco: build an implantable brain-computer interface that allows us to communicate wirelessly with anything that has a chip. This symbiosis would be, according to Musk, as our insurance against the "existential risk" that means the advance of artificial intelligence. It all sounds very sci-fi: in theory, we could instantly absorb knowledge from the cloud or transmit images from one person's retina to the visual cortex of another. "I think the best solution is to have a layer of artificial intelligence that can work biologically inside of us," Musk said. "The first use of technology will be to repair brain injuries as a result of a stroke," he described in a long article. published in Wait Buy Why. 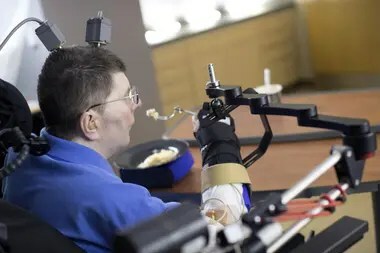 Amyotrophic lateral sclerosis, stroke or other disorders leave their confinement and communicate their needs and desires to others, operate word processing programs or other software, control a wheelchair or neuroprosthetics. "It would be a great improvement in the quality of life," says Leung. "First we'll try it on non-human primates." What will come next? The aim of DARPA, it is presumed, would be to improve the skills of military personnel. "We could get to drive drones with thought," speculates Leung, who admits that the field of brain-computer interfaces is fertile ground for science fiction. But just as these technologies open up new possibilities, they also imply new risks and ethical problems. Could groups of hackers steal internal data from a body – one of the current problems with the Fitbits – or use the body of a person against their will? "Neuronal prostheses force us to reevaluate how we think about the responsibility of our actions," says philosopher Walter Glannon. neural dust They multiply hopes and also threats, such as the loss of individuality and mental privacy. warn the specialists in neuroética Mark A. Attiah and Martha J. Farah in an article -. Would we be human if we could make others move or act from our thinking? Would we be human if our minds never operated independently of others? These neurotechnologies could bring tectonic social changes. " Previous articleNew EU letter to the government: "Tell us why the debt does not fall"